Few birds achieve more distinction than Alex, the famous subject of Irene Pepperberg's language experiments. Named "Bird of the year" by the New York Times after his death in 2007, Alex learned thousands of words, expressed understanding of numbers, could identify objects, colors, shapes, and sometimes showed a certain peevishness about cooperating that made him seem even more human. Nor are his achievements exceptional. 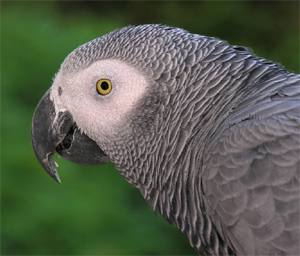 People who have worked with African (or Congo) Greys know their remarkable abilities go far beyond their capacity to imitate human speech. My own family has included an African Grey named Max for many years, and I can personally attest to their amazing skills. These birds can perfectly articulate long sentences -- even months after hearing them only once. (For example, singing the first line of "Jingle-Bells" in April. The bird can carry a pretty good tune.) After heaing the telephone ring, they will say "Hello" at exactly the same time I do. In fact, by anticipating many words that I make in casual conversation, Max makes me realize how stupid and stereotyped most human speech actually sounds. Max seems to enjoy showing off -- making the noise of a soda can tab a fraction of a second before it actually happens. The bird often will say "bye-bye" when I get ready to leave -- putting on my coat, picking up my car keys, or even walking around looking for them. This is no random utterance, but a phrase that is always spoken in the appropriate context of someone leaving. Even more remarkably -- the bird on one occasion was able to show it understood the exact meaning of the phrase. Some months after we added a nest box to the cage, Max laid an egg (instantly changing her name to "Maxine.") When we discovered the egg, the whole family crowded around the box to see -- much to Max's dismay. Max stuck her head out and in a loud, fierce voice spoke -- "Bye-bye!"